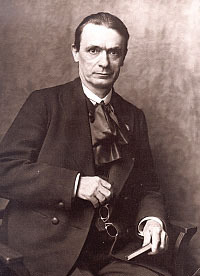 Rudolf Joseph Lorenz Steiner (27 (or 25) February 1861 – 30 March 1925) was an Austrian philosopher, social reformer, architect, economist and esotericist. Steiner gained initial recognition at the end of the nineteenth century as a literary critic and published philosophical works including The Philosophy of Freedom. At the beginning of the twentieth century he founded an esoteric spiritual movement, anthroposophy, with roots in German idealist philosophy and theosophy; other influences include Goethean science and Rosicrucianism. Steiner's father, Johann(es) Steiner (1829–1910), left a position as a gamekeeper in the service of Count Hoyos in Geras, northeast Lower Austria to marry one of the Hoyos family's housemaids, Franziska Blie (1834 Horn – 1918, Horn), a marriage for which the Count had refused his permission. Johann became a telegraph operator on the Southern Austrian Railway, and at the time of Rudolf's birth was stationed in Murakirály (Kraljevec) in the Muraköz region of the Kingdom of Hungary, Austrian Empire (present-day Donji Kraljevec in the Međimurje region of northernmost Croatia). In the first two years of Rudolf's life, the family moved twice, first to Mödling, near Vienna, and then, through the promotion of his father to stationmaster, to Pottschach, located in the foothills of the eastern Austrian Alps in Lower Austria. In 1891, Steiner received a doctorate in philosophy at the University of Rostock, for his dissertation discussing Fichte's concept of the ego, submitted to Heinrich von Stein, whose Seven Books of Platonism Steiner esteemed.:Chap. 14 Steiner's dissertation was later published in expanded form as Truth and Knowledge: Prelude to a Philosophy of Freedom, with a dedication to Eduard von Hartmann. Two years later, he published Die Philosophie der Freiheit (The Philosophy of Freedom or The Philosophy of Spiritual Activity—Steiner's preferred English title) (1894), an exploration of epistemology and ethics that suggested a way for humans to become spiritually free beings. Steiner later spoke of this book as containing implicitly, in philosophical form, the entire content of what he later developed explicitly as anthroposophy. In contrast to mainstream Theosophy, Steiner sought to build a Western approach to spirituality based on the philosophical and mystical traditions of European culture. The German Section of the Theosophical Society grew rapidly under Steiner's leadership as he lectured throughout much of Europe on his spiritual science. During this period, Steiner maintained an original approach, replacing Madame Blavatsky's terminology with his own, and basing his spiritual research and teachings upon the Western esoteric and philosophical tradition. This and other differences, in particular Steiner's vocal rejection of Leadbeater and Besant's claim that Jiddu Krishnamurti was the vehicle of a new Maitreya, or world teacher, led to a formal split in 1912/13, when Steiner and the majority of members of the German section of the Theosophical Society broke off to form a new group, the Anthroposophical Society. Steiner took the name "Anthroposophy" from the title of a work of the Austrian philosopher Robert von Zimmermann, published in Vienna in 1856. Despite his departure from the Theosophical Society, Steiner maintained his interest in Theosophy throughout his life. English sculptor Edith Maryon belonged to the innermost circle of founders of anthroposophy and was appointed to head the Section of Sculptural Arts at the Goetheanum. In his commentaries on Goethe's scientific works, written between 1884 and 1897, Steiner presented Goethe's approach to science as essentially phenomenological in nature, rather than theory- or model-based. He developed this conception further in several books, The Theory of Knowledge Implicit in Goethe's World-Conception (1886) and Goethe's Conception of the World (1897), particularly emphasizing the transformation in Goethe's approach from the physical sciences, where experiment played the primary role, to plant biology, where both accurate perception and imagination were required to find the biological archetypes (Urpflanze), and postulated that Goethe had sought but been unable to fully find the further transformation in scientific thinking necessary to properly interpret and understand the animal kingdom. Steiner emphasized the role of evolutionary thinking in Goethe's discovery of the intermaxillary bone in human beings; Goethe expected human anatomy to be an evolutionary transformation of animal anatomy. Steiner defended Goethe's qualitative description of color as arising synthetically from the polarity of light and darkness, in contrast to Newton's particle-based and analytic conception. Olav Hammer has criticized as scientism Steiner's claim to use scientific methodology to investigate spiritual phenomena that were based upon his claims of clairvoyant experience. Steiner regarded the observations of spiritual research as more dependable (and above all, consistent) than observations of physical reality. However, he did consider spiritual research to be fallible:p. 618 and held the view that anyone capable of thinking logically was in a position to correct errors by spiritual researchers. "Rudolf Steiner: The Architectural Concept of the Goetheanum", in: Sokolina, Anna, ed. Architecture and Anthroposophy, two editions. (In Russian with the Summary in English) 268pp. 348 ills. Moscow: KMK, 2001 ISBN 5873170746; 2010 ISBN 5873176604. ^ "World Economy (Lecture Series)". wn.rsarchive.org. 1972. Retrieved 23 April 2019. ^ Some of the literature regarding Steiner's work in these various fields: Goulet, P: "Les Temps Modernes? ", L'Architecture D'Aujourd'hui, December 1982, pp. 8–17; Architect Rudolf Steiner Archived 24 September 2015 at the Wayback Machine at GreatBuildings.com; Rudolf Steiner International Architecture Database; Brennan, M.: Rudolf Steiner ArtNet Magazine, 18 March 1998; Blunt, R.: Waldorf Education: Theory and Practice – A Background to the Educational Thought of Rudolf Steiner. Master Thesis, Rhodes University, Grahamstown, 1995; Ogletree, E.J. : Rudolf Steiner: Unknown Educator, Elementary School Journal, 74(6): 344–352, March 1974; Nilsen, A.:A Comparison of Waldorf & Montessori Education, University of Michigan; Rinder, L: Rudolf Steiner's Blackboard Drawings: An Aesthetic Perspective Archived 29 November 2005 at the Wayback Machine and exhibition of Rudolf Steiner's Blackboard Drawings Archived 2 February 2007 at the Wayback Machine, at Berkeley Art Museum, 11 October 1997 – 4 January 1998; Aurélie Choné, "Rudolf Steiner's Mystery Plays: Literary Transcripts of an Esoteric Gnosis and/or Esoteric Attempt at Reconciliation between Art and Science? ", Aries, Volume 6, Number 1, 2006, pp. 27–58(32), Brill publishing; Christopher Schaefer, "Rudolf Steiner as a Social Thinker", Re-vision Vol 15, 1992; and Antoine Faivre, Jacob Needleman, Karen Voss; Modern Esoteric Spirituality, Crossroad Publishing, 1992. ^ a b Paull, John (2018) The Library of Rudolf Steiner: The Books in English, Journal of Social and Development Sciences. 9 (3): 21–46. ^ a b Paull, John (2011) "Attending the First Organic Agriculture Course: Rudolf Steiner’s Agriculture Course at Koberwitz, 1924" European Journal of Social Sciences, 21(1):64–70. ^ In Austria passing the matura examination at a Gymnasium (school) was required for entry to the University. ^ Preface to 1924 edition of The Theory of Knowledge Implicit in Goethe's World-Conception, with Specific Reference to Schiller, in which Steiner also wrote that the way of knowing he presented in this work opened the way from the sensory world to the spiritual one. ^ Mombauer, Annika (19 April 2001). Helmuth Von Moltke and the Origins of the First World War. Google Books. ISBN 9780521019569. Retrieved 1 June 2018. ^ Paull, John (2018) The Home of Rudolf Steiner: Haus Hansi, Journal of Biodynamics Tasmania, 126:19-23. ^ Dilthey had used this term in the title of one of the works listed in the Introduction to Steiner's Truth and Science (the doctoral dissertation) as concerned with the theory of cognition in general: Einleitung in die Geisteswissenschaften, usw., (Introduction to the Spiritual Sciences, etc.) published in 1883. "Archived copy" (PDF). Archived from the original (PDF) on 17 April 2014. Retrieved 16 April 2014. CS1 maint: Archived copy as title (link). ^ Paull, John (2018) Torquay: In the Footsteps of Rudolf Steiner, Journal of Biodynamics Tasmania. 125 (Mar): 26–31. ^ Paull, John (2011) "The secrets of Koberwitz: The diffusion of Rudolf Steiner’s Agriculture Course and the founding of Biodynamic Agriculture", Journal of Social Research & Policy, 2(1):19–29. ^ a b Paull, John (2011). "Organics Olympiad 2011: Global Indices of Leadership in Organic Agriculture" (PDF). Journal of Social and Development Sciences. 1 (4): 144–150. ^ Purvis, Andrew (6 December 2009). "Biodynamic coffee farming in Brazil". the Guardian. Retrieved 25 March 2018. ^ "Biodynamic Agricultural Association of Southern Africa - Green Africa Directory". Green Africa Directory. Retrieved 25 March 2018. ^ a b Paull, John (2011) "Biodynamic Agriculture: The Journey from Koberwitz to the World, 1924–1938", Journal of Organic Systems, 2011, 6(1):27–41. ^ Anderson, Neil (June 2011). "On Rudolf Steiner's Impact on the Training of the Actor". Literature & Aesthetics. 21 (1). ^ Liukkonen, Petri. "Andrey Bely". Books and Writers (kirjasto.sci.fi). Finland: Kuusankoski Public Library. Archived from the original on 10 June 2002. ^ Michael Ende biographical notes, "Michael Ende und die magischen Weltbilder"
^ Shearmur, Jeremy (1 September 2015). "The Birth of Leonard Read's "I, Pencil" | Jeremy Shearmur". fee.org. Retrieved 6 June 2016. ^ a b c Olav Hammer, Claiming Knowledge: Strategies of Epistemology from Theosophy to the New Age, Brill 2004, pp. 329; 64f; 225-8; 176. See also p. 98, where Hammer states that – unusually for founders of esoteric movements – Steiner's self-descriptions of the origins of his thought and work correspond to the view of external historians. ^ Storr, Anthony (1997) . "IV. Rudolf Steiner". Feet of Clay: Saints, Sinners, and Madmen: A Study of Gurus. New York: Free Press Paperbacks, Simon & Schuster. p. 69. ISBN 0-684-83495-2. ^ Robert Todd Carroll (12 September 2004). "The Skeptic's Dictionary: Rudolf Steiner (1861–1925)". The Skeptic's Dictionary. Retrieved 15 December 2010. ^ Paull, John (2011) "A Postcard from Stuttgart: Rudolf Steiner's 150th anniversary exhibition 'Kosmos'", Journal of Bio-Dynamics Tasmania, 103 (September ), pp. 8–11. ^ Thesenpapier von Dr. Jan Badewien zur Veranstaltung: Antijudaismus bei Rudolf Steiner?, Universität Paderborn, 23.01.02. ^ There are thirty-nine volumes solely consisting of Steiner's books, plays, and essays in the catalog of the Rudolf Steiner Archiv: GA 1–36, 40a, and 44–45. In addition, volumes 38–39 and 262–263 contain Steiner's correspondence, for a grand total of forty-three volumes of writings. Eleanor Merry (17 December 1873 in Eton, Berkshire, UK – 16 June 1956 in Frinton-on-Sea, Essex, UK), was an English poet, artist, musician and anthroposophist with a strong Celtic impulse and interest in esoteric wisdom. She studied in Vienna and met Rudolf Steiner in 1922 after becoming interested in his teachings. She went on to organize Summer Schools at which Steiner gave important lectures, and was secretary for the World Conference on Spiritual Science in London in 1928. Elmfield Rudolf Steiner School Limited is an independent school situated in Stourbridge, West Midlands, England. It educates around 260 children aged from 3 to 17 who follow the international Steiner Waldorf Education curriculum. Marie Steiner-von Sivers (born Marie von Sivers – 14 March 1867 – 27 December 1948) was the second wife of Rudolf Steiner and one of his closest colleagues. She made a great contribution to the development of anthroposophy, particularly in her work on the renewal of the performing arts (eurythmy, speech and drama), and the editing and publishing of Rudolf Steiner's literary estate. RSF Social Finance, located in San Francisco, California, is one of very few orgs actively seeking to and investing towards, a transformation of how we view and use money.RSF is one of the last and most esteemed of the socially responsible investment orgs of the 1990s. RSF is a non-profit financial services organization offering investing, lending, and philanthropic services to individuals and enterprises.RSF has over one thousand clients and more than $120 million in consolidated assets. RSF Social Finance is the trade name of Rudolf Steiner Foundation, Inc. and its affiliates. It has lent over $100,000,000 and made more than $50,000,000 in grants to non-profit organizations and social enterprises. As of 2006, RSF was growing at a 60% annual rate. Raphael House Rudolf Steiner School is a coeducational, state integrated composite school in Belmont, Lower Hutt. It provides a Waldorf education for Years 1 to 13. Matriculation starts when children are 7 years of age. Rudolf Steiner School Kings Langley was a Steiner School located in Kings Langley, Hertfordshire, England, formed in 1949. The school catered for pupils aged 3 to 19 years old. The School was set on 10 acres (4.0 ha) of grounds, on the site of Kings Langley Palace, a 13th-century Plantagenet royal palace. In July 2017 the Department for Education (DfE) issued an order of de-registration of the school. This followed earlier concerns over child safeguarding resulting in a March 2017 instruction from the DfE to not admit new students.An appeal of the de-registration order on behalf of the school failed, and the school closed on the 29th of March 2019. Rudolf Steiner University College (Norwegian: Rudolf Steinerhøyskolen; RSH) is a state-accredited and state-funded private university college in Oslo, Norway. It was founded in 1981 and is recognised under the Law for Private University Colleges and is fully state-funded (state funding increased gradually from 50% in 1983 to 100% from 1997 onwards). The university college offers bachelor's degrees in Waldorf education for teachers and kindergarten teachers, a master's degree in Waldorf education, and various other courses. It is organised as a non-profit foundation, and its board of trustees is chaired by Cato Schiøtz.In cooperation with the Alanus University of Arts and Social Sciences (Germany), the university college publishes the international academic journal Research on Steiner Education. It is also involved in cooperation with East European countries, hosting the International Waldorf Summer Seminar.Since 1994, the former Berle School in Professor Dahls gate 30, Frogner, has served as its main building. The college also has a campus in Fyresdal. Schwarz Stein is a Japanese visual kei electronic music duo formed by Hora (洞) and Kaya (迦夜) in 2001 (as "Rudolf Steiner"), who disbanded in 2004 and regrouped in 2014. Social threefolding is a sociological theory suggesting the progressive independence of society's economic, political and cultural institutions. It aims to foster human rights and equality in political life, freedom in cultural life (art, science, religion, education, the media), and associative cooperation in economic life. The idea was first proposed by Rudolf Steiner in the great cultural ferment immediately following the end of the First World War. Steiner suggested the cooperative independence of these three societal realms could either be achieved through a gradual transformation of existing societal structures, or through a "clean sweep" at a "big scale." Steiner believed that the three social spheres had very gradually, over thousands of years, been growing independent of each other, and would naturally tend to continue to do so, and that consciously furthering aspects of this independence thus works in accordance with society's natural evolution. Steiner held it to be socially destructive when one of the three spheres attempts to dominate the others; for example, theocracy means a cultural impulse dominates economy and politics; unregulated and socially irresponsible varieties of capitalism allow economic interests to dominate politics, culture and media; and state socialism means political agendas dominate culture and economic life. A more specific example: Arthur Salter, 1st Baron Salter suggests governments frequently fail when they begin to give "discretionary, particularly preferential privileges to competitive industry." The goal is for this independence to arise in such a way that those three realms can provide mutual balance. Many concrete reform proposals to advance a "threefold social order" at various scales have been advanced since 1919. Some intentionally cooperative businesses and organizations, mostly in Europe, have attempted to realize a balance between the three spheres, within local structures. Waldorf schools deserve special mention in this regard. Another application has been the creation of various socially responsible banks and foundations. Bernard Lievegoed incorporated significant aspects of social threefolding in his work on organizational development. A co-educational, non-denominational and independent education for children aged birth to eighteen (Playgroup to High School) based on the educational philosophy of Rudolf Steiner. Titirangi Rudolf Steiner School provides a comprehensive Waldorf education Curriculum and environment which encourages and promotes independent thinking and social responsibility. The School understands children as beings of body, soul and spirit and guides them to develop compassion and reverence for themselves and the world community through realising their social, academic and artistic potential. 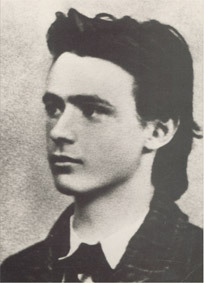 The unique gifts and contributions of each child are honoured through a developmentally appropriate awakening of thinking, feeling and willing as indicated by Rudolf Steiner. Waldorf education, also known as Steiner education, is based on the educational philosophy of Rudolf Steiner, the founder of Anthroposophy. Its pedagogy strives to develop pupils' intellectual, artistic, and practical skills in an integrated and holistic manner. The cultivation of pupils' imagination and creativity is a central focus. Individual teachers and schools have a great deal of autonomy in determining curriculum content, teaching methodology, and governance. Qualitative assessments of student work are integrated into the daily life of the classroom, with quantitative testing playing a minimal role and standardized testing usually limited to what is required to enter post-secondary education. The first Waldorf school opened in 1919 in Stuttgart, Germany. A century later, it has become the largest independent school movement in the world, with about 1,150 independent Waldorf schools, 1,800 kindergartens and 646 centers for special education located in 75 countries. There are also a number of Waldorf-based public schools, charter schools and academies, and homeschooling environments. Public funding of Waldorf schools in English-speaking countries has met some road blocks due to widespread rejection of vaccines among the parents of Waldorf pupils and the mystical and antiquated nature of some of Steiner's theories. Several Waldorf schools in the UK have closed due to their administrations' failure to adhere to normally accepted standards of education (e.g. required levels of literacy, safety standards for child welfare, and mistreatment of special needs children). Wilhelm Rath (14 May 1897, in Berlin – 13 January 1973, in Wolfsburg/Kärnten, Austria) was a German writer, translator, bio-dynamic farmer and anthroposophist. He is best known for his research and translations of certain medieval mystics, notably the Friend of God from the Oberland, Bernard Silvestris, Alanus ab Insulis and John of Hildesheim. Upon leaving school in 1914, he volunteered for active service and was taken captive towards the end of World War I. As a prisoner of war in England, he learned of Anthroposophy and took up contact with Rudolf Steiner after the war. He subsequently became committed to the work of biodynamic agriculture, which he pursued until his death.With Ernst Lehrs he contributed significantly to the organisation of the youth conference in which Rudolf Steiner held the lecture cycle “The Younger Generation” and which led to the founding of an Esoteric Youth Circle.